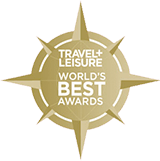 STOWE, Vt―Boundless Journeys was voted a Top 5 Tour Operator by Travel + Leisure readers in the 2013 World’s Best Awards survey. Each year, Travel + Leisure queries its readers in the travel industry’s most prestigious consumer survey: the World’s Best Awards. Readers rate airlines, hotels, destinations, and tour operators, among others. Readers are asked to rate tour operators on the following criteria: staff/guides, itineraries/destinations, activities, accommodations, food, and value. On July 2, 2013, Travel + Leisure announced the winners, and Boundless Journeys was among the Top 5 on the list of the World’s Best Tour Operators, with less than a percentage point dividing the results of the top five. Travel + Leisure 2013 World’s Best Awards survey results will be featured in the August 2013 issue of Travel + Leisure. Boundless Journeys is especially pleased that Wilderness Safaris, their partner in Southern Africa, also made the Top Safari Outfitters list. Small-group and customized, private safaris with Wilderness Safaris can be planned through Boundless Journeys.